Necromancers pursue the path to lichdom for many reasons. Some are truly evil with dark plans that will take centuries to complete. But others are looking for nothing more than immortality. The transformation to lichdom is shrouded in mystery and secrecy, and few who undertake the process fully understand all the implications. Many are completely unaware that the enigmatic rituals that promise immortality may have sinister side effects. Thus it is possible that some liches were once paladins pursuing a centuries-long plan of good, or researchers who only wanted a few more years to complete their studies. Over time, the necromantic energies of the creation rituals corrupted them, and now they are evil liches... but the spark of humanity remains. 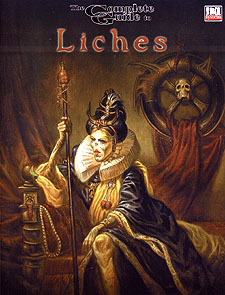 The Complete Guide to Liches is a stand-alone, world-neutral sourcebook covering everything you ever wanted to know about liches. It is the seventh volume in the Complete Guide series. Each Complete Guide is exactly what it sounds like: a complete guide to playing a given kind on monster. As a GM, you'll learn how to run that monster, both in combat and role-playing situations. The Complete Guide to Liches can be inserted easily into any fantasy setting.